Definition at line 21 of file MachineDominanceFrontier.h. 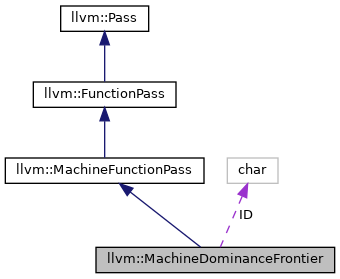 Definition at line 30 of file MachineDominanceFrontier.h. Definition at line 27 of file MachineDominanceFrontier.h. Definition at line 26 of file MachineDominanceFrontier.h. Definition at line 25 of file MachineDominanceFrontier.h. Definition at line 28 of file MachineDominanceFrontier.h. Definition at line 31 of file MachineDominanceFrontier.cpp. Definition at line 77 of file MachineDominanceFrontier.h. References llvm::DominanceFrontierBase< BlockT, false >::addBasicBlock(). Definition at line 85 of file MachineDominanceFrontier.h. References llvm::DominanceFrontierBase< BlockT, false >::addToFrontier(). Definition at line 53 of file MachineDominanceFrontier.h. References llvm::DominanceFrontierBase< BlockT, false >::begin(). Definition at line 57 of file MachineDominanceFrontier.h. Definition at line 97 of file MachineDominanceFrontier.h. References llvm::DominanceFrontierBase< BlockT, false >::compare(), F(), getAnalysisUsage(), releaseMemory(), and runOnMachineFunction(). Definition at line 93 of file MachineDominanceFrontier.h. References llvm::DominanceFrontierBase< BlockT, false >::compareDomSet(). Definition at line 61 of file MachineDominanceFrontier.h. References llvm::DominanceFrontierBase< BlockT, false >::end(). Definition at line 65 of file MachineDominanceFrontier.h. Definition at line 69 of file MachineDominanceFrontier.h. References llvm::DominanceFrontierBase< BlockT, false >::find(). Referenced by llvm::WebAssemblyExceptionInfo::getAnalysisUsage(), and llvm::rdf::DataFlowGraph::getNextShadow(). Definition at line 73 of file MachineDominanceFrontier.h. Definition at line 49 of file MachineDominanceFrontier.cpp. Definition at line 39 of file MachineDominanceFrontier.h. Definition at line 45 of file MachineDominanceFrontier.h. References llvm::DominanceFrontierBase< BlockT, false >::getRoot(). Definition at line 41 of file MachineDominanceFrontier.h. References llvm::DominanceFrontierBase< BlockT, false >::getRoots(). Definition at line 49 of file MachineDominanceFrontier.h. References llvm::DominanceFrontierBase< BlockT, false >::isPostDominator(). Definition at line 45 of file MachineDominanceFrontier.cpp. Referenced by compare(), and runOnMachineFunction(). Definition at line 81 of file MachineDominanceFrontier.h. References llvm::DominanceFrontierBase< BlockT, false >::removeBlock(). Definition at line 89 of file MachineDominanceFrontier.h. References llvm::DominanceFrontierBase< BlockT, false >::removeFromFrontier(). Definition at line 39 of file MachineDominanceFrontier.cpp. Definition at line 35 of file MachineDominanceFrontier.h.